A reminder of how fine men may be when willing to guided by conscience and truthful principles. Could the contrast be starker? Washington presided over the Philadelphia Convention that drafted the United States Constitution in 1787. Washington was elected the first president, unanimously by the Electoral College, something that has never been repeated in American history. 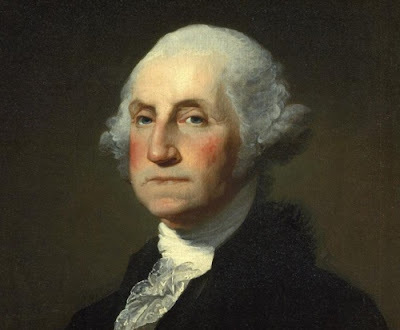 Washington belonged to no political party and served as America’s first President from April 30, 1789 to March 4, 1797. After two terms Washington thought it was important that he step aside. He believed that a peaceful transition of power to a newly elected president was necessary before his death. He feared that if he died in office and the vice-president ascended to the presidency, it would appear too much like an heir ascending to the throne after the death of a king. Washington died in 1799. Henry Lee, delivering the funeral oration, declared Washington “first in war, first in peace, and first in the hearts of his countrymen”. Historical scholars consistently rank him as one of the greatest United States presidents. First President of the United States, George Washington married a very wealthy widow and inherited hundreds of acres of farm land in Mount. Vernon. On the farm, George Washington owned hundreds of slaves. History re-written. Of course, Obama mania trinkets were for sale at every corner in DC's busy train station. Hey Trev, thanks for featuring that famous unbeliever George Washington – who WAS a sectarian as was Thomas Jefferson. Plenty more quotes where they came from. Trevor: I just got "The Real George Washington" and looking very forward to reading it. Nice post. Thank you, as always.